HCM CITY — Flood-sensor chips will be installed at an additional 32 flooding hotspots to warn HCM City residents of potential floods from heavy rains or tides, according to the HCM City Urban Drainage Company. The city made the decision after seeing positive results from chips that had been installed earlier at five flooding hotspots. The hotspots included Bình Thạnh District’s Nguyễn Hữu Cảnh Street; Thủ Đức District’s Dương Văn Cam Street; Tân Phú District’s Trương Vĩnh Ký Street; Gò Vấp District’s Lê Đức Thọ Street; and District 7’s Huỳnh Tấn Phát Street. Bùi Văn Trường, a HCM City Urban Drainage Company officer, said the company had previously sent staff to manually measure water levels and report the results. “But this created a problem because we could not proactively draft plans to tackle any rising problem,” he said. An American company introduced flood-sensor chips to the city, but they were too expensive to install, costing hundred of millions of đồng at each hotspot. After Sài Gòn Hi-Tech Park (SHTP) manufactured sensor chips, the Urban Drainage Company redesigned them to detect changes in water levels in the sewage system. As results are sent to the company, it can confirm whether particular sewage pipes would be able to hold increasing amounts of water caused by heavy rains, tides. Recently, the company also collaborated with the Hydro-Meteorological Forecasting Centre to forecast potential rains three hours in advance. Rain measurements, together with water-level forecasts, sent from sensor chips placed at sewage pipes will help the company efficiently predict where and how floods are going to arise. Trường said the company has been working on a mobile application that uses data from chips to inform residents in advance about potential flooding in their areas. “Thù Đức Market is prone to floods. Now that locals are aware of potential floods, they can vacate or take away their goods from their stalls before they are submerged in water,” he said. Flood-sensor chips also benefit authorities who can more easily allocate manpower, water pumps and other items needed to combat flooding, he added. 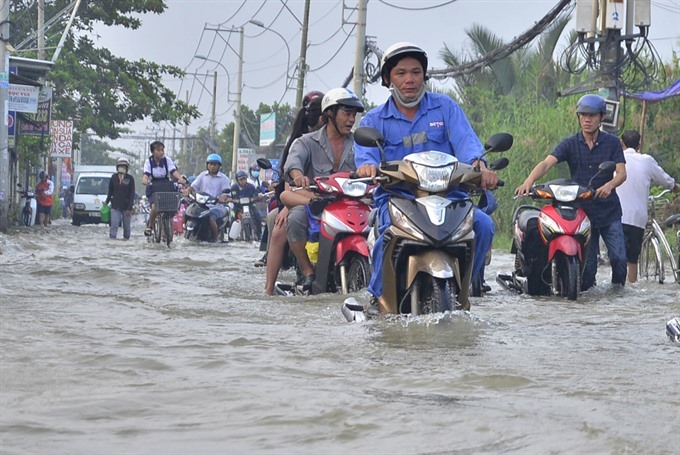 Many streets in HCM City, including Gò Vấp District’s Phan Huy Ích Street, Bình Tân District’s Hồ Học Lãm Street and District 5’s Dương Tử Giang Street, on Monday (May 15) were submerged in water after a two-hour heavy rain. Drivers of motorbikes that lost power in the rain had to get off and push their bikes on water-clogged streets.